Sport champions as lifestyle models? An interview with Valerio Bianchini, a living legend of basketball and one of the speakers at the next Sportmeet Convention. Valerio Bianchini has discovered and managed many a champion. 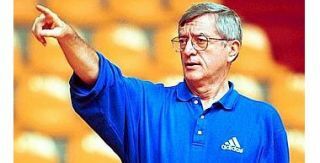 He’s been working with basketball for over 40 years, has won three championships with three different teams, two European cups and one club intercontinental cup. He is the Italian national team’s former trainer and is deeply committed to studying sports and the world surrounding them. Valerio Bianchini will be amongst the most authoritative speakers at the next Sportmeet Convention, which will be held at Castelgandolfo on April 8th-10th 2011. Do sports champions deserve the title of life champions too? “All the real champions I came across were also true men, not people who were trained to be champions. Whether he wants it or not, a trainer plays a pivotal role: he is an educator. He must train the athletes so that they become models for younger generations, both as players and as citizens”. Is there a special path to becoming a champion? I’ll answer this question through a personal experience. When I was a kid I loved reading Salgari and Verne: I read their books and dreamt. Then one fine day my mum brought me to the parish recreation centre; I believe she wanted me to find out that there were also other people out there. In sports I found a world of interaction I had not known before, and one that school didn’t offer. I discovered hard work and a physical pain so different from the one I had felt at home, where I could always look for comfort. There, it helped one to become tough, fostering personal identity. I understood that muscles weren’t everything in basketball: what was also called for was the ability to reflect—and to do it fast. That’s how my passion for sports, my first real love, grew stronger and stronger. The game of basketball involves five players, just like a hand’s fingers: Taken on their own, fingers aren’t very strong, but if they get together and close in a fist, they can hit with an unimaginable power. Variety means strength. Then there are the rules, a written book describing the spirit of the game, and a referee to enforce them. And the referee must be respected because this is what makes me big. And more rules, coming from team-mates or from the coach: “Don’t look at the ball while dribbling: this way you’ll be able to look at your team-mates…”. When sport becomes a profession, can a trainer still play the role of educator?